Best Paintball Mask Buying Guide for 2019, From Paintball Gun Doc! The best paintball mask is not just the most expensive mask out there! It will depend on your specific needs. Do you need something light? Do you need something ultra-safe? Do you need something in which you can breathe heavily, without fogging up your lens? Understand all the factors that will decide how comfortable a mask will be for you and only then proceed to even look for masks. This post will attempt to guide you through just that process! Before we get into our very detailed post, here are some quick links to pages on our website which talk about specific queries you might have about paintball masks. 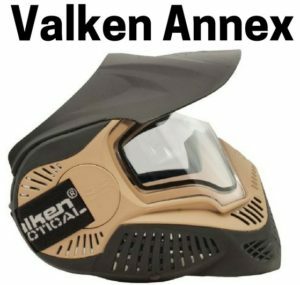 Check out the Valken Annex MI 9 priced at just $50 if you want the best cheap paintball mask out there. If you are specifically looking for a paintball mask for eyeglasses, we recommend the gorgeous Empire EVS mask that is built for comfort. If you are interested in Dye paintball masks, check out the I5 and I4, one of the fastest selling paintball masks out there. Also, visit out home page for our exhaustive post on the best paintball guns out there! Strap width – GSR – Pro-Strap. Turn dial to tighten! No loop adjusting! If you can afford $180 for a paintball mask, just stop reading right here and buy the Dye Precision i5. It is a masterpiece. If you can’t quite afford so much but can manage to wrangle $129, go for the Dye Precision i4, discussed just a bit down below. The Dye i5 has a lot of the same components as the i4, but with some spectacular additional features. Check out the exciting Dye i5 Thermal Paintball Goggles at Amazon, here. First, let’s get the essentials out of the way. You get state of the art dual pane thermal lenses that just won’t fog, even if you try to make it fog. Simply the best paintball mask anti fog model out there. Then you have the 290 Degree field of vision with insane peripheral vision, giving you fantastic sights down the field. After this is where the i5 goes to the next league. First, there is the GSR Pro strap, a thick but uber-comfortable strap in the back that has a dial which you can adjust, while the mask is sitting on your head. Turn it a few notches to the right to tighten and a few notches to the left to loosen. That is it! No more pulling that little loop to tighten it when you have people to paint! Another fantastic features is the replaceable foam inside of the mask. What you potentially have here is a mask for life. Foam is the first thing to go in a mask and it is actually a pity to change a mask just because the foam, a small component, has worn out. Dye has fixed this. The replaceable foam comes with pins that you just push into the chassis of the mask, essentially giving you a new mask. Besides being replaceable, the soft-compression formed fleece wrapped foam is the most comfortable foam that will rest on your face, at least when it comes to paintball masks! The Dye i5 also comes with a Go Pro mount inbuilt into the mask so you don’t have to do any additional tinkering when you want to mount that camera, to show off your amazing game play. The i5 is also e-VOKE system compatible, allowing you to enjoy the power of awesome wireless and real time game information provided via a heads up display, by the M2, as you are hunting down your opponents. It is the next big thing in paintball and only the i5 allows you to enjoy it in style. The i5 is a little bigger than the i4, about 15% to 20% bigger actually, giving you added protection for your jawline. The ear padding is also better than what the i4 has to offer, with hard but comfortable foam, with a vent to allow all noises to come in, so you have your sound intelligence. The vents in the front are also bigger, allowing you to breathe out better and also help carry your voice out further and in a more directional manner, giving you a better chance of getting through to your team mates. Until last year, the i4 was simply unbeatable. But the i5 is the new kid on the block and is here to stay. Again, if you can afford $180 on a mask, a critical component that can protect your face, this is the mask you should buy, with your eyes closed! Besides all the high-performance features, we also just have to say that this is one of the most fashionable paintball masks out there, allowing you to make a serious style statement while out on the field. Read our Dye i5 Mask Review here. Or, are you ready to buy? 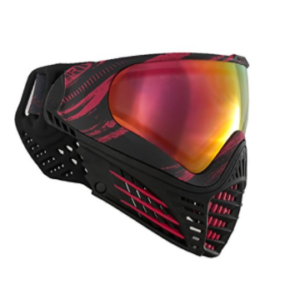 Buy the Super Cool Dye i5 Paintball Mask from Amazon, here. Color and design options – 25 Different Options! At $129, you might be like, “whoa, that’s too much for a mask”. But then this is the best of the best. This is an anatomically designed mask which basically means that it will fit all facial contours that the human race can throw at it! 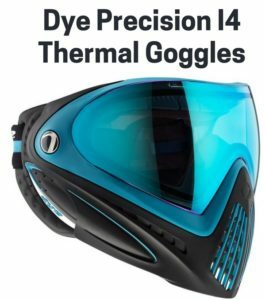 Check out the exciting Dye i4 Thermal Paintball Goggles at Amazon, here. The lenses are scratch resistant and also thermally treated which means that you just can’t fog it up, no matter how much you huff and pant while inside of it! It also does not fog whether you play in freezing conditions or extremely hot conditions. The fit is just ultra-comfortable, thanks to the anatomically contoured fit as well as the tiger buckles in the back, that make securing and fastening the mask very snug, while also keeping it comfortable. The protection on the inside is also made out of material that will wick away sweat and heat, keeping you cool while you destruct your opponents! Available in over 25 different styles, this is one mask that will give you the best protection while also making you look insanely cool on the field. It doesn’t come with full face protection but it does cover the ears. It will give you brow to chin protection. If you yell or yawn, a little bit of your chin will be exposed as well. But, if unrestricted field of vision and very high comfort levels are top priority in a mask, this is the one for you. This is also one mask that will give you very close proximity to your gun’s sights, like how it would be if you wore no mask at all! This is also a great mask if you need to communicate with your teammates. If you are the kind that yells across orders or cries for help (lol), this will carry your voice to where it needs to go! One word of caution though. If you consider yourself as someone big, or with a rather big head, it might we wise to try on the mask to see if there is ample coverage. Read out Dye i4 Mask Review here. Or, are you ready to buy? Buy the Incredibly Priced Dye i4 Performance Mask from Amazon, here. This is easily one of the most stunning or masks to look at. Giving you a Halo soldier like look, the lens on this mask is massive with a capital M! You get a large 270 degree field of vision and you just have to wear it to experience a whole new way in which you can look down the field. Check out the Very Futuristic Looking Empire EVS Thermal Paintball Goggles at Amazon, here. The bottom of this mask is very soft and collapsible and gives you maximum chances at a bounce. What is also special is the super-soft fit around the ears, with probably best in class protection. This mask is slightly wider than all masks on the market and that results in a very comfortable fit around the ears, without the mask pushing in all day long. The inside foam is a triple density super plush foam that also has a moisture wick fleece that will prevent any fog ups, if the dual pane thermal lenses somehow fail in their anti-fog duties. The foam is also replaceable, meaning that you don’t have to throw away the mask just because the foam wears out! The thermal lenses come with UV A/B protection which is always welcome, if you play in sunny regions or during summers. Changing the lens is very easy. You just have to pull on a tab, rotate the ear piece and then push out the lens and do the same for the other side. First time users will fidget with it and clumsy around but once you figure it out, it shouldn’t take more than 30 to 45 seconds to take out and put back your lens. At $150, this is a super-comfortable mask. You just have to try out the panorama like view to appreciate the massive lens on this mask. A fantastic mask if you particularly appreciate ear comfort as well. If your budget stretches to $150, you will appreciate this mask with a fantastic sight and ability to bounce off paintballs off your chin, an area you get hit often. 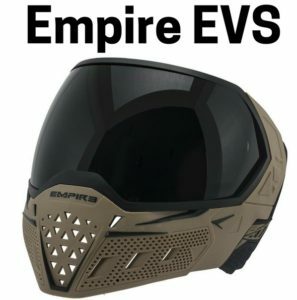 Read our Empire EVS Mask Review Here. Or, are you ready to buy? Buy the Stunning Empire EVS Mask from Amazon, here. This is a solid mask if you want full face protection, with protection for the back of your head and a bit of neck as well. It is also very comfortable to wear, thanks to being light and because of its well designed aeration system. Like the Dye I4, this is also a mask that will allow you to get close to your sights, thanks to its low profile. 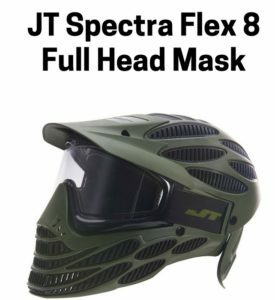 Check out the best mid-priced paintball mask in JT Spectra Flex 8 Paintball Goggles, at Amazon, here. The anti-fogging feature works pretty well. But then, there are very small patches of fog that form after extended use, like after hours together. A quick wipe fixes such fog patches for another hour or two but you can use a fan Mod to eliminate such patches altogether. Something like a Vortex II fan will do just fine, as it has a two-way air-exchange system, one that will keep your JT mask cool and without fog as well. If there was a gripe about this mask, it is that its designers built the mask for someone with smaller than average ear lobes. There is a chance that just a tiny bit of your ear lobes might be exposed on the side. If you have exceptionally large ear lobes, this is going to leave your ears hanging, quite literally! This mask comes with a nice little storage bag. For the price, it can be your go-to mask when you need the maximum amount of head protection out on the field. Read out JT Spectra 8 Flex Mask Review Here . Or, are you ready to buy? Buy the All Round Performer JT Spectra Flex 8 from Amazon, here. Color and design options – Black/Several Fire Color Styles/35 Style Options! The Virtue VIO Ascend is probably, scratch that, THE most customizable paintball mask ever made. 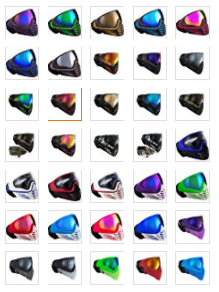 There are 16 cool lens options for this paintball mask, with choices ranging from dark smoke, light smoke, chromatic gold to super bright, sporty and exciting colors and finishes like Chromatic Amber, Chromatic Sapphire, Fade Red and even Fade Blue. The customization options don’t end with just the lens either. Even the straps are customizable. You can use your VIO Ascend mask with as many as 35 different straps, with varying colors and designs. This mask can also use a visor and you have 18 different visors to choose from as well. Check out the over 30 awesome color options of the Virtue VIO Ascend, at Amazon. Customization aside, this mask has a lot to offer in other departments as well. It is a fantastic mask for breathing and for letting sound in and sound out, without echo or distortion. The foam is entirely replaceable which means that you can virtually use this mask forever, just switching out the foam and lenses for new ones, when your old foam or lens starts to wear and tear. This is a mask that is very similar to the Dye i4, but at a better price point, depending on which color and lens option you buy. Without a chromatic lens, you can grab this mask for as little as $89 although the price can go up to as much as $199 if you mix and match to customize it a lot. You can read our very in-depth and full review of the Virtue VIO Ascend here. Or, are you ready to buy? 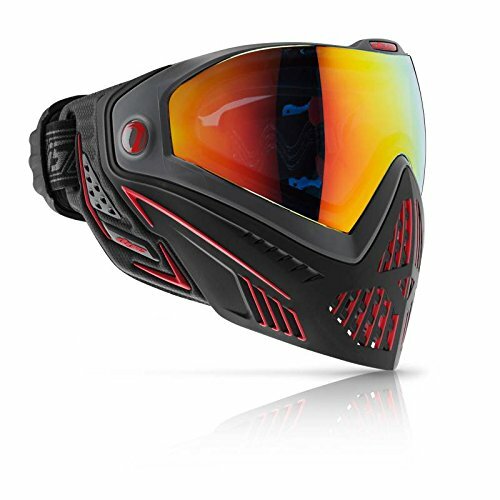 You can buy the very cool Virtue VIO Ascend paintball goggles from Amazon, here. At $65, this is a very comfortable mask. The comfort is largely due to the very comfortable back-strap supported by also very comfortable chin straps. Please note that the mask may expose a little bit of jawline if you have a very large head. Also, if you have a unusually large head, the tension in the back-strap might get a bit too annoying after wearing for an hour or so. Check out the mid-range VForce Profiler Mask Goggles at Amazon, here. The whole package comes in a convenient carry bag. At about $65, this mask gives you maximum bang for buck. Though the stock lens is a clear lens without UV or scratch protection, you can upgrade to a number of after-market lenses that comes in colored and mirrored styles, with added UV and scratch protection layers. The optional sun cap or visor is a nice touch and we recommend that you put it on. It makes the mask look cool, while giving you a little protection against squints because of the sun’s glare. The masks single pane lenses actually do better than higher-priced double pane lenses when looking into bright sunlight. The single-pane anti-fogging lenses keep away fog for the most part. But, if you are a heavy breather and play in very cold or very hot temperatures, you might want the Dye I4 or similar sort of lenses to be assured of anti-fogging experience. One common complaint however is that the foam on the inside, though comfortable, wears and tears a little prematurely. It can get a little scratchy as it wears and tears. But, if you are not throwing this mask around, the foam lining will do just fine and last as long as the mask. 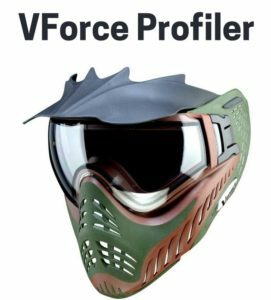 Read our VForce Profile Mask Review Here. Or, ready to buy? Buy the reliable VForce Profiler from Amazon, here. If you can’t quite afford the I4 from Dye, we would recommend this Sly Profit series mask that retails for just under $80. The highlight of this mask is that it has dual adjustable straps in the back, giving you a adjustable cross-fit that will allow you to dive, roll and throw yourself around on the field, without having to adjust your mask. It of course comes with removable chin-straps as well, giving you a 100% secure fit. Check out the High All Round Scorer Sly Profile LE Mask at Amazon, here. The soft foam on the inside almost has a velvety feeling and is very good at absorption as well. The dual pane thermal treated lenses do a fantastic job at keeping fog at bay, even in very hot or very cold temperatures. The stock clear lens has a gradient fade which is a cool little feature as the top half of the lens can be used to protect your eyes from the glare of bright sunlight while the bottom half of your lens can be viewed for very accurate sighting, like when you are looking down your sights. Sly gives you plenty of gradient fade color options lens upgrades in addition to a very popular amber lens (ideal for both indoor and outdoor) upgrade as well. The whole package comes in a very high quality micro-fiber material like bag that will keep your mask and lens scratch free when you tug it around on the field. A great mask that gives you great comfort, a very stable fit and excellent field of vision, without the worries of fogging. 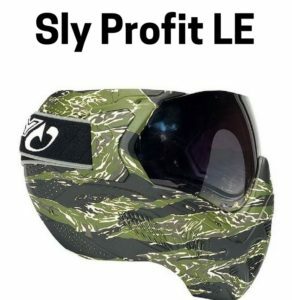 Read our Sly Profit LE Mask review here. Or, are you ready to buy? Buy the very popular Sly Profit LE from Amazon, here. Empire took the best of the E-Vent line of masks and merged it with the comfort and practicality of great performance masks like the JT Flex to produce the E-Flex. The highlight of the E-Flex is the collapsible bottom that will give you a unhindered fit for your mask, even when your chin is down on the ground, when taking aim for that kill shot. The large lens give you 10 degrees of extra viewing angles (270) instead of the usual 260 that you get with most other lenses in this price range. This is also the only mask that claims to have zero-distortion lenses. Check out the High Performance Empire E-Flex Mask at Amazon, here. The foam on the inside is a super comfortable hypo-allergenic thick Spectra foam that gives you a snug but comfortable fit. Breathing through this mask is simply awesome and since most of what you breathe out is expelled through the flexible and well vented chin skirt, fog is never an issue. Even when the temperatures are very high or very low, the thermally treated dual pane lenses will take care of fog issues. Simply put, if you ever tried on the E-Vent or the JT ProFlex, this is the mask for you, as it offers the best features of those two masks. This is an actual claim by Empire! 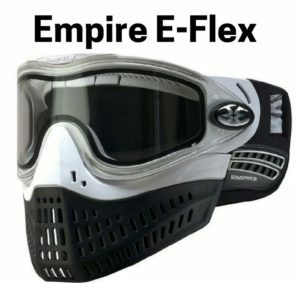 Read our Empire E-Flex Mask Review Here. Or, are you ready to buy? Buy the Best Mid Range Performance Mask in Empire E-Flex, from Amazon, here. If you are willing to spend more than just $30 for a basic mask like the Tippmann Valor (discussed below), this is the best mask at the $50 price point. The Valken Annex has a nice rubbery collapsible bottom that will aid with bounces. Not many $50 or sub $50 masks have a collapsible bottom. Check out the Nicely Priced Valken Annex at Amazon, here. The Valken also comes with chin straps, a visor and dual pane thermal lenses with a thermal foam barrier, another feature you typically won’t find in $50 or sub $50 masks. The venting is ample on the bottom and on the sides and the quick lens change system is incredibly easy to use, allowing you to pull out your lens in just 15 seconds and put it back in another 15. The quick lens change system is very similar to the much higher priced Profit LE mask. The foam on the inside is plush and soft and remarkably good for a $50 mask. The weight is very light as well. Please do note that this mask’s rubber bottom isn’t as flexible as what you would find in a JT Flex or higher priced mask. It is comfortable, but certainly not up there with the big boys. Again, if $50 is all you want to spend on a mask, it isn’t going to get better than this. Read our Valken Annex MI 9 Mask Review here. Or, are you ready to buy? Buy the Excellent Value Performance Valken Annex from Amazon, here. At $30, you get high value for the price you pay. Though this mask doesn’t have a lot to offer on the comfort side, it isn’t downright uncomfortable either. It even comes with a removable visor. Check out the very affordable Tippmann Valor at Amazon, here. Despite having a $30 price tag, Tippmann have still thrown in a quick-change lens that you can take out and replace in 30-40 seconds with practice. The strap in the back is a pretty thick strap with silicone beading that gives you great durability. Should the strap wear out, you can simply replace the whole strap. The Valor comes with chin straps as well, giving you a robust, adjustable, albeit not a cushion fit. Where it lacks is the lack of flexibility in its build. There is no cushion foam on the inside. The inside is rather made of molded foam, another name for a hard rubber like material. The skeleton of this goggle is also made form hard plastic. Don’t expect any shock absorption when you wear this and get hit. You will feel every shot, though you will only feel impact and not pain. The general build isn’t very flexible either, meaning very little shock absorbing bounce when you take hits. Of course, bouncing helps you stay in the game longer as well. There is large venting over the mouth and in the area that runs up to the ears, giving you a very good chance of getting unhindered sound communication. If you are just getting into paintball and are not even sure if you will even continue to play the sport, you can pick this up to see how it fares as a beginner mask. In fact, this is the rental mask of choice when you try to rent a mask at your paintball field. If you are all right with the comfort the mask offers, you can pick up one of these Tippmann thermal dual pane anti-fog lenses and bump up the quality of your vision, with anti-fog and anti-glare protection. These distortion free lenses come in clear, mirror, smoke and yellow finishes. Once again, for the price you pay, this gives you a lot of bang for your buck. 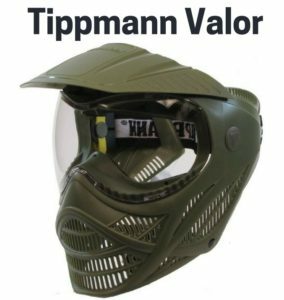 Read our Tippmann Valor Mask Review Here. Or, are you ready to buy? Buy the Tippmann Valor from Amazon, here. Why? Because some paintball venues will require you to wear a full mask if you are less than 18 years old! That’s why. So, if you are 16 and show up earnestly for a paintball competition with just a mesh mask or just goggles, you are going to be denied entry. If you are less than 18 years of age, a full mask is the only way to go! The last thing you want to be is distracted by a claustrophobic feeling that your paintball mask gives you. A mask must be comfortable to wear, to allow you to perform at your best! Have you ever taken a hit to the ears? If you haven’t, you can be rest assured that it will happen to you. It is just a matter of time, we assure you! Not a nice feeling. If you want to save those ears, you must get a mask that will protect your ears. About 1.5 lbs is about just right for a weight that you want to be carrying on your neck, in the form of mask. Anything heavier and it will weigh you and your performance down. Feeling hot, getting your goggles or glasses all fogged up are all issues that pertain to how breathable your mask is. Generous peripheral vision and a unobstructed view from your mask is critical to winning those closely-fought shootouts! Paintball is a great summer sport. With gorgeous sunlight comes UV damage that can wear down your eyes. UV protection is highly recommended. Your paintball gun mask can be simply awesome but what good is it if the strap can keep it on your head! Also, if you have an unusual shaped head, it is imperative that the mask is a bit flexible so it can conform to the shape of your head. Ideally, your paintball mask must be able to take even a direct speedball hit frenzy without letting you feel any significant impact. Shock absorption and durability is key! Obviously one of the practical factors that come into play. Don’t cheap out on a paintball mask but. A paintball can cause serious damage if it hits the right places on your head. Spend as much as you can on a great paintball mask! 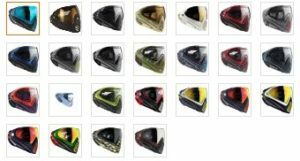 Now that you have a fair idea about what to look for in a paintball mask, we wish you all the best and a great lot of fun when choosing the best paintball mask for yourself!